Grand Ravines North: From Fillmore Street travel one half mile north on 42nd Avenue to the entrance. Grand Ravines South: Entrance is on Fillmore Street east of 40th Avenue. This map shows amenities, parking areas, features and trails. 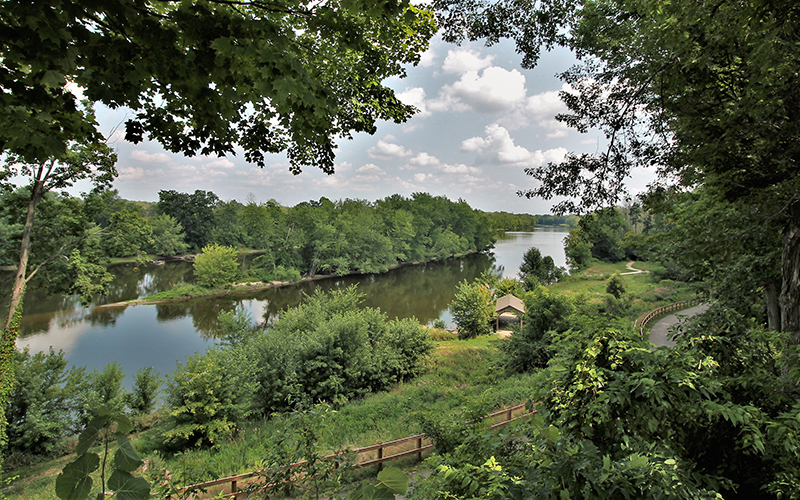 Grand Ravines is an 187-acre Ottawa County Park with a half-mile of frontage on the Grand River and can be accessed from the north and south. 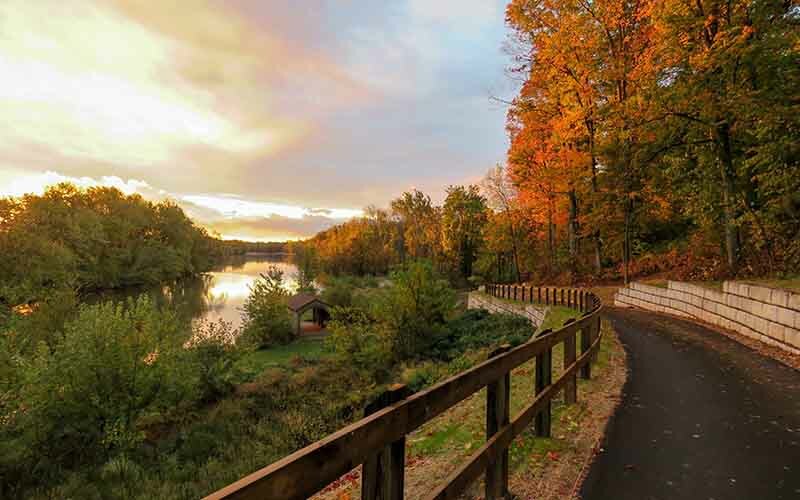 A county-wide natural features inventory completed in 1988 identified the extensive system of deep ravines that extends along the GVSU riverfront and through what is now park property as one of the most significant natural features in Ottawa County. The deep ravines feature unique plant communities, including a variety of ferns and trees uncommon to the area, such as Kentucky coffee-trees, paw paws and towering tulip trees. The southerly 68 acres of Grand Ravines, the former Timmer Farm, was acquired in 1999 with park millage funds. The adjacent 100-acre parcel, which included a house overlooking the river, was purchased in 2011 with assistance from a Michigan Natural Resources Trust Fund grant. Later in 2011, the Parks Commission added Grand River frontage upstream to establish the 19-acre John J. Helstrom Natural Area. 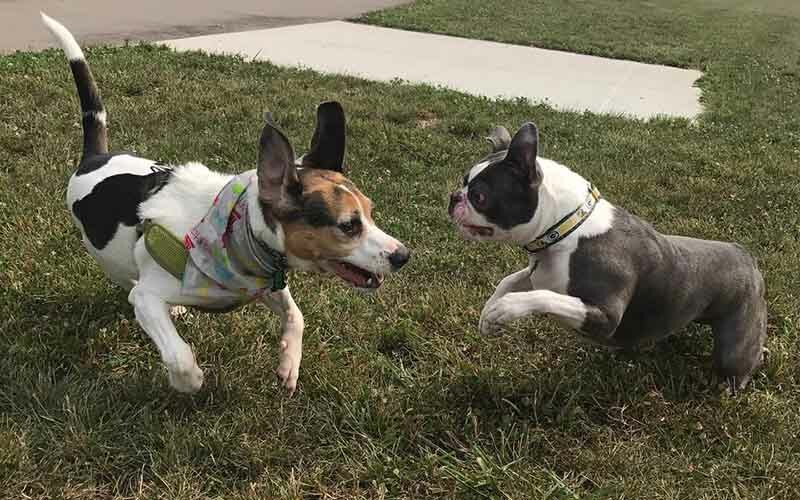 Major improvements to the park began in 2015, including the construction of the county’s first off-leash dog park and restoration of the historic barn. 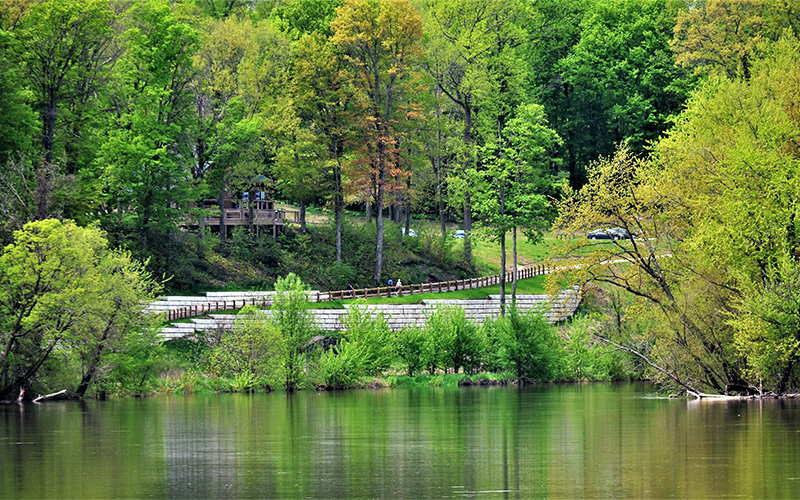 Trails, entrance improvements, and renovation of the lodge overlooking the river on the north side of the park were also completed in 2015. In 2017, parking was expanded and a north trailhead was added. The accessible pathways that connect the north and south portions of the park and lead to the river were completed with help from a Land and Water Conservation Fund grant. 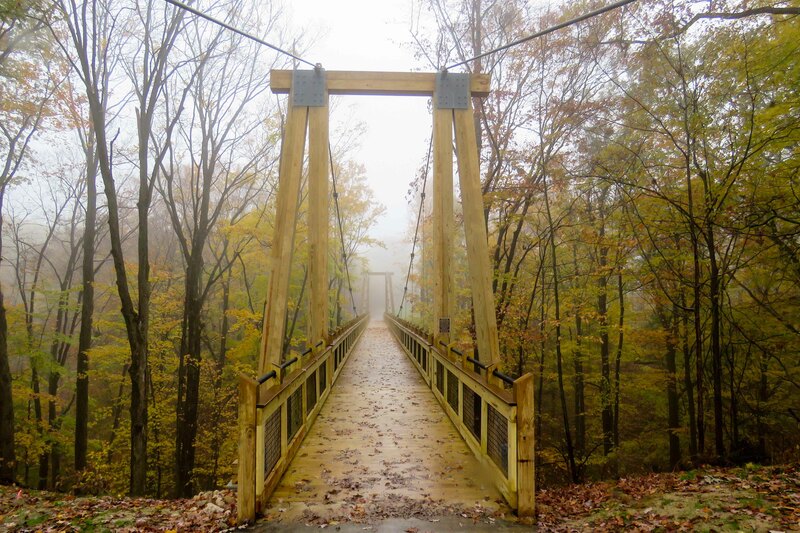 Finally, a 275' long, 70' high suspension bridge traversing one of the park’s namesake ravines was constructed. The bridge is fully ADA accessible and is believed to be the longest pedestrian suspension bridge in Michigan. The bridge is easiest to access from the south side of the property, off of Fillmore St. Take the paved path on the EAST side of the park (closest to the barn). Follow it about a quarter of a mile north. The bridge can be accessed from the north side of the property, see trail maps for the best route. In 2018, Grand Ravines was awarded the mparks Park Design Award. 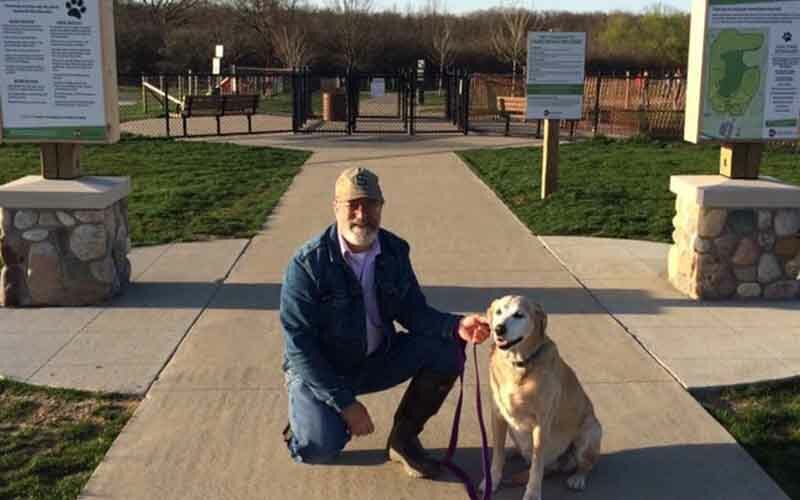 Like the Grand Ravines Dog Park on Facebook to stay up-to-date on dog park news. Grand Ravines South is home to the county's first enclosed off-leash dog park. Please review the dog park rules before visiting the park. Dogs are not permitted in park buildings, restrooms, picnic shelters, playground areas, off-trail, or as posted. For more park properties that allow dogs off leash year-round, take a look at the Ottawa County Open Space Lands. Includes 21-acres of enclosed dog park, with separated fenced areas for large and small dogs. 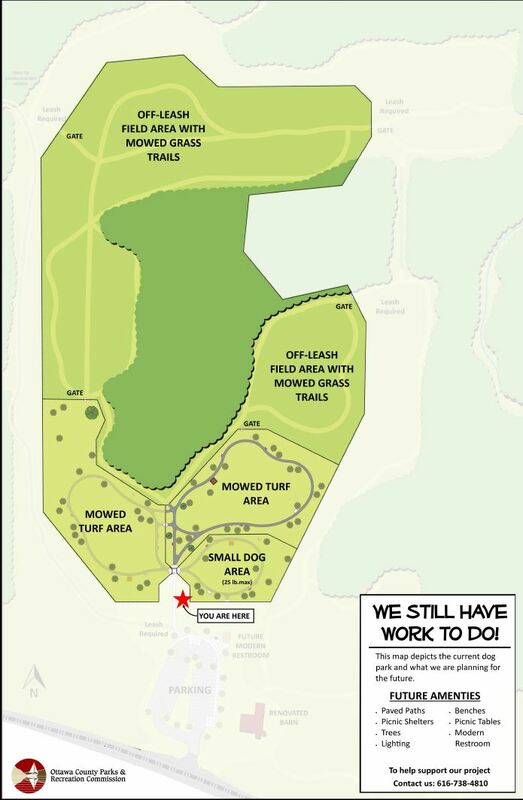 Additionally, there will be fenced trails for off-leash walking. The Parks & Recreation Commission has already built the parking lot and support facilities and has allocated $75,000 toward building the park, but that will only pay for fencing and trails. In order to include the amenities that will make it a gold star facility, we will be seeking funding from local businesses and residents. To learn more or to make a donation, please visit this page.